Gave him a problem he’s a-fraid of them all! But Jungle Man Bob just sprinted a-way! Made him happy so he played with them all! The song 'Jungle Man Bob' was written in May 2014 by the children in Year 3 and 4 at Parkhill Primary School. The song story was that there was a man, Jungle Man Bob, whose job was to go to the Jungle and look after and care for the animals there. However there was a slight problem - Bob was terrified of all of them! 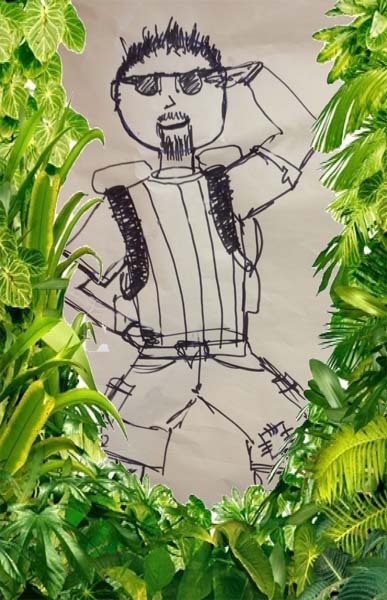 When they were first writing the song/ story of 'Jungle Man Bob' we sketched out what we thought he may look like...do you think he looks a little like someone you may all know? !